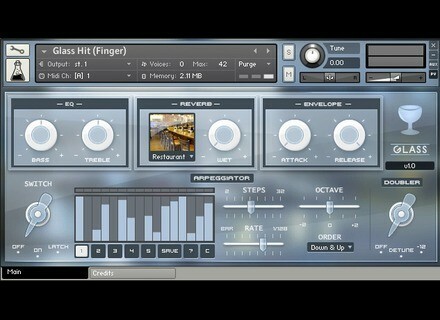 Glass, Drum/Percussion Sample from AudioThing. AudioThings continues to sample the everyday life sounds and launches Glass, a library for which they used a balloon wine glass. AudioThing explains that for this new Kontakt library, they used a balloon glass (though the pictures on the website show a brandy glass with short stem), chosen for its crystalline sound and its long sustain. The editor hit the glass with fingers and hand palms, a piano hammer and a metal stick. The glass was also "played" with wet fingers on the border or throwing small screws into the goblet, and they also processed and slowed down some sounds in order to create atmospheric pads. The library features 10 .nki instruments, 7 .nkm multis, up to 10 round robin samples and 3 velocity layers. 114 WAV 24-bit / 44.1kHz files are included, as well as 7 custom reverb impulse responses. Glass is available for the introductory price of 9.95€ instead of 12€ through June 2nd. You can listen to audio demos at www.audiothing.net. The Roland JP-80x editor plug-in is out Mystery Islands confirms and launches the Roland JP-8000 and 8080 hardware synths editor plug-in for Mac OS X.
PSP Audioware launches a meter plug-in bundle PSP Audioware releases PSP 2Meters, a bundle with two sound level measurement plug-ins for Mac and Windows. A classic bass at Ilya Efimov's Following the Modern Bass launched in february, Ilya Efimov introduces a new virtual bass for Kontakt, in a traditional classic style.